Medium: Coloured Aquatint circa 1830 Image Size: 395 x 590mm, 15.5 x 23.25"
Order No. 7019 Price: SOLD Paper Size: 395 x 590mm, 15.5 x 23.25"
Watercolourist of landscapes, aquatint engraver and lithographer of marine, sporting and topographical subjects after his contemporaries. Was apprenticed to R. Havell I from whom he learnt to engrave. From 1825 he began to aquatint marine subjects after W.J. Huggins whose daughter bertha, he married. It is for the production of large plates that he is best remembered as an engraver. From 1828 he also began engraving sporting subjects, particularly after J. Fernley and C. Hancock. In the 1840's he gave up engraving to concentrate on watercolour painting. Lived and worked in London and was elected to the Royal Watercolour Society. 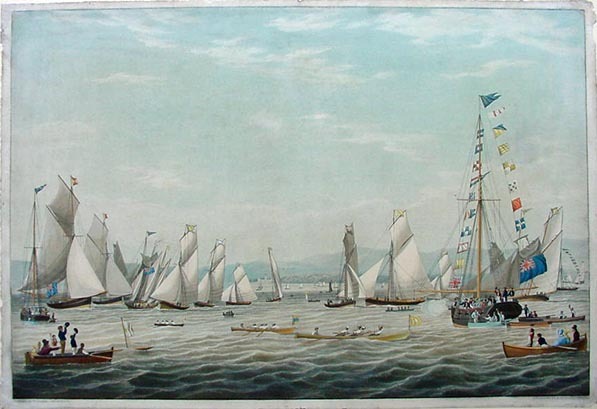 Regatta of the Royal Northern Yacht Club Aquatint print circa 1830.